Cranberry Cookies with White Chocolate Drizzle – Chewy, brown sugar cookies with dried cranberry pieces and white chocolate drizzled on top. The perfect cookie for your holiday entertaining needs! Man, did October fly by, or what?! I cannot believe tomorrow is November already. Where did the time go?! Before you know it, Christmas will be here and the post-holiday blues will soon begin. That’s why I soak up every ounce of Christmas cheer once November begins. That means Christmas playlist on loop, Christmas desktop background, and Christmas baking nonstop. It would also mean Christmas decorations but I promised my husband that I’d wait until after Thanksgiving. What a Grinch. The first of my Christmas baking for this year are cookies that surprised me the first time I tried them. They are chewy brown sugar cookies, filled with dried cranberries and white chocolate. The colors and flavors are super festive and perfect for the holiday season. So why did these surprise me when I tried them? OK confession time…I don’t really like white chocolate. It’s too sweet for me. I know, blasphemous speak from a sweets-enthusiast. I want to like it so much, but I just can’t get on board. I’m more of a fan of the rich, dark stuff. And wow, was I shocked! The tartness of the cranberries toned down the sweetness in the white chocolate. And they were so chewy and moist. I love a great chewy cookie! The original recipe for these is made with white chocolate chips mixed in the batter (see below). But I wanted to make these extra special for cookie season so I thought drizzling the white chocolate on top would give them an extra pizzazz. However, if you want them with chocolate chips in the batter, you can just mix them in with the cranberries. No other changes necessary. I made half the batch with them so you could see how they look. Make sure you use dark brown sugar instead of light brown sugar. I love love love using dark brown sugar in my cookies because it gives them more chew and moisture due to the extra molasses. I also recommend using it for your chocolate chip cookie recipes. You won’t regret it! You gotta chill the dough for at least 2 hours before baking or they will spread as thin as a pancake. If you’re in a rush, I have a trick for making the dough chill faster: scoop the dough into balls before chilling. It takes much less time to chill a little ball of dough versus a big bowl of dough. You can also place these in the freezer for 30 minutes and it should do the trick. Use a cookie scoop to get perfectly sized cookies. Plus, when they are all the same size, they will bake evenly. Here is the one I use. I recommend a small cookie scoop (about 1 tablespoon). If you have dark-colored baking sheets, your cookies will probably brown on the bottom before they finish on top. I finally figured this out after years of getting darker bottoms than tops. To adjust, you need to reduce the temperature of your oven by 25 degrees. This is true for any dark-colored pans that you have: cake pans, square pans, cupcake pans, you name it. These are perfect cookies for the holiday season, including your cookie exchanges! Give them a try and let me know how you like them. What other kinds of cookies do you make this time of year?? 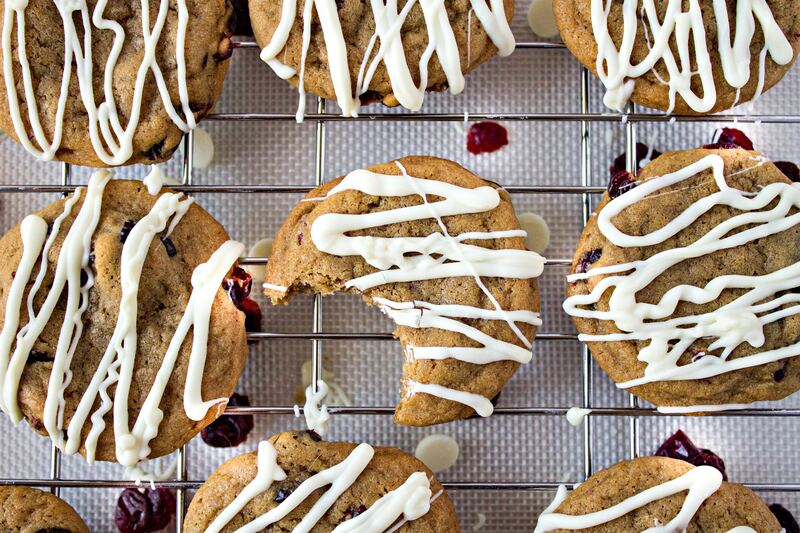 Chewy, brown sugar cookies with dried cranberry pieces and white chocolate drizzled on top. The perfect cookie for your holiday entertaining needs! Place softened butter into the mixing bowl of a stand mixer. Cream on medium speed until light and fluffy, about 1 minute. Add sugars and beat together until fluffy, about 2 minutes. Add egg and vanilla and beat on medium until completely combined. In a separate medium bowl, mix flour, corn starch, baking soda, and salt until combined. Add to wet ingredients about 1/2 cup at a time until completely mixed together. The dough will be dense, but that's normal. Add in dried cranberries and mix for a few seconds until mixed into the dough. Using a small cookie scoop (or a tablespoon), scoop out a ball of dough and place it onto a large plate. Repeat with the rest of the dough until finished. Cover with plastic wrap and refrigerate for 2 hours. If you're in a rush, you can freeze them for 30 minutes. Once the dough is completely chilled, remove it from the fridge. Preheat oven to 350 degrees. Take dough balls and roll them between your palms to smooth them into a perfectly round ball. Place on two baking sheets, 12 per sheet. Make sure they're spaced out about 2 inches. Place cookie sheets in preheated oven and bake for 9-10 minutes. Make sure to rotate halfway through so that the cookies bake evenly. Once cookies are done baking, remove from oven and let them sit 5 minutes before transferring to a cooling rack. While the cookies are cooling, melt white chocolate in the microwave by heating in 30-second intervals, stirring after each interval. Place melted chocolate into a ziplock bag and set aside until the cookies are completely cool. Once cookies have completely cooled, cut a very small corner off of the ziplock bag. Drizzle white chocolate all over the cookies in a quick zigzag pattern. You can serve immediately but let the white chocolate harden before storing. These look delicious!! I have a cookie exchange party next month and I think I’m gonna make these! Yay! I hope you get to eat tons of yummy cookies. Cookie exchanges are my favorite! These are going on my Christmas cookie list, not that I couldn’t love them year round! Yay! I’m glad your Christmas season is a little longer. I feel like ours goes by so fast! I love cranberries. It pairs so well with orange and spices. The cranberry recipes are just starting to show up! As much as I love pumpkin, cranberries will be a welcome change. This recipe looks so yummy. Haha I totally understand that. I’ve been replacing pumpkin recipes with apple cider recently but I think you’re right…cranberry is next! Holy moly these look insanely good! I’ve pinned to use for Thanksgiving. YUM! These look amazing!!! I can not believe that November is here already. It’s crazy! I get into the holiday season big time once November hits. I am right there with you! Cue the holiday music!! Haha you and me both!! Gorgeous cookies. I love the cranberries jewels in them. Yum! Mmm these look delicious! They remind me of a Cranberry Biscotti we do every year!! I love how festive they are , and the flavors are so perfect together! Adding to my Christmas baking list for this year! Thanks so much! Mmm biscotti. I gotta try that out! Those cookies look wonderful! I’m always a fan of cranberry and white chocolate together, I’ll have to try them! Pinning for later! Yes, these two make an excellent combo! Yes for sure! They hold up well so they won’t break in cookie tins, etc. These cookies look delicious! I can’t believe it’s almost November either! Time flies!! These look delicious and I know my little Cookie Monster son will love them. I will be adding these to my Christmas cookie list this year. Thanks for sharing. Haha I have to admit, I am also a cookie monster! Cookie!! Oh my, these look delicious! The colors are certainly Christmasy, and I bet they are delicious to boot. My 12 year old daughter has been cooking/baking since she was about 6. She wants to be a chef when she grows up. I am going to give her this recipe so she can make these this weekend!